Invisalign® is quickly becoming one of the most popular ways for adults to correct misaligned teeth. For teeth that are poorly aligned, crowded, widely spaced, or exhibit an overbite, underbite, or crossbite, we recommend Invisalign® as an effective, virtually undetectable way to correct your smile. Invisalign® is an alternative to traditional braces that works by using a series of clear, customized aligners that, over time, move your teeth into their proper alignment. Because the Invisalign® clear aligners work without wires, bands, and brackets, they are not noticeable in most situations. 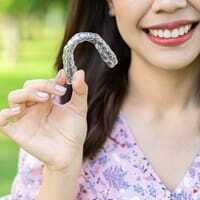 Patients will typically wear a series of 18 to 30 different clear aligners depending on the severity of their misalignment. Each aligner is worn for two weeks and is then replaced by the next aligner in the series until the prescribed alignment is achieved. The Invisalign® aligners are worn both during the day and through the night. They can be removed as necessary for eating, brushing, and flossing. Patients generally finish treatment in less than a year.